Are You Ready for Inflation? The latest PMI report says it's on the way. We just had a 148-point jump on the Dow. This one-day, 1.2% gain left the index safely ensconced above the magic 12,000 mark. Was it a fluke, or is this recovery real? Even as individual companies reported their individual earnings beats, the drumbeat of economic activity pounded out a win as well. 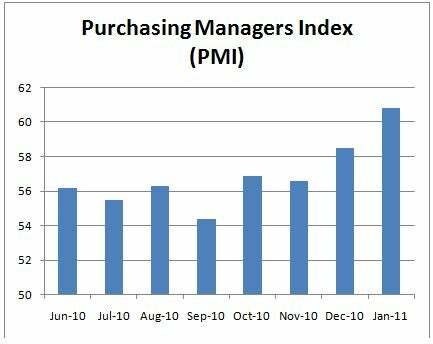 Tuesday's "PMI" report from the Institute of Supply Management showed a second straight monthly increase in manufacturing activity. Scoring 60.8% on ISM's index, the economy is well north of the 50% level that indicates economic growth -- and that's just the beginning of the good news. A whole array of individual sectors showed surprising strength in January. Exports rose a whopping 7.5% against December levels. New orders climbed 5.8%. The backlog of work yet to be done leapt an incredible 11%. Not one economic indicator on the list showed anything approaching a decline. In short, there's good reason to be optimistic -- but the news isn't all good. The only indicator showing greater growth than backlogs, it turns out, was "prices." Respondents polled by ISM complained that "commodity pricing is starting to increase." They worried that "continued weakness in the dollar is … increasing our material costs." Running down the shopping list of commodities whose prices are spiking, we find good news for Alcoa (NYSE: AA) and Rio Tinto (NYSE: RTP), since "aluminum" leads the list. But honestly, pretty much everything seems more expensive these days, from chemicals to plastics to steel. According to ISM, "no commodities are reported down in price." Recovery is on the march -- but inflation is following in its footsteps. At least, that's my read on this week's PMI report. If you see something different, tell us about it below.